You know that rare moment when an album makes an impact so great, not only do you never forget it, but manage to remember every word to every song throughout the remainder of your life? Elton John’s Goodbye Yellow Brick Road is that album for me. Although it’s been 41 years since Elton John released his seminal double LP, this classic album has been revisited and reissued as a super deluxe, 5-disc ultimate edition to commemorate its 40th anniversary. I’ll admit I was a bit skeptical about another remaster (as this is not the first time GYBR has been cleaned up), but this is truly the best this album has ever sounded. I’ve probably listened to this record hundreds of times, and I can honestly say this new remaster brings out new details and a clarity like I’ve never before heard. If this is one of your favorite Elton albums, you owe it to yourself to own this, as it is without a doubt the definitive version. With its iconic cover and sales of over 31 million copies to date, Goodbye Yellow Brick Road is Elton John’s best-selling studio album and considered by many to be his landmark, career-defining masterpiece. The 17-track set includes many of John’s most famous songs, including: “Bennie and the Jets,” “Saturday Night’s Alright for Fighting,” “Candle in the Wind,” and the hit title track. This lavishly produced package includes an all new remastered version of the original album, B-sides, demos, the complete Live at Hammersmith concert from 1973, a DVD of Bryan Forbes’ film Elton John and Bernie Taupin Say Goodbye to Norma Jean and Other Things, a 100-page illustrated hardcover book, as well as newly recorded cover versions by Ed Sheeran, Hunter Hayes, Miguel, Emili Sande, John Grant, The Band Perry, Imelda May, Fall Out Boy, and Zac Brown Band. Goodbye Yellow Brick Road 40th Anniversary Edition also available on HD pure audio Blu-ray, and 2-LP limited edition heavyweight 180-gram yellow vinyl. 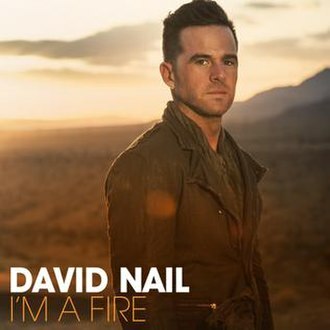 After a three year wait since his last full-length effort, David Nail returns to country music exuding confidence and growth as a songwriter and vocalist on his third MCA Nashville release, I’m a Fire. Armed with the number one lead single “Whatever She’s Got,” the Missouri native and “Let It Rain” singer’s latest project is loaded with knockout tracks including the smoldering “Burnin’ Bed,” the picturesque “When They’re Gone (Lyle County)” with Little Big Town, and the fervent follow-up single “Kiss You Tonight,” co-penned by American Idol rocker David Cook. I’m a Fire’s only pitfalls are its overly excessive use of female harmony vocals (at times making Nail seem like a featured duet partner on his own album), and the turgid cover of Glen Campbell’s peerless Jimmy Webb classic “Galveston” featuring Lee Ann Womack. With the latter tacked onto the end, it not only diminishes the impact of the set’s title track (which should’ve served as the album’s closer), but ultimately comes off sounding like a superfluous afterthought. Though it definitely appears as if the Gallagher brothers’ sibling rivalry won’t be making way for an Oasis reunion anytime in the near future, fans of Noel and Liam’s heyday have something to celebrate. To commemorate the 20th anniversary of the band’s debut album, a deluxe remastered version of Definitely Maybe will be released on May 19th. Throughout 2014, deluxe versions of (What’s the Story) Morning Glory and Be Here Now will follow as well. The recordings are sourced from the original masters, which have been remastered by Ian Cooper at Metropolis. The three albums will be released chronologically with B-sides and rarities from the band’s archives in super deluxe, standard, and triple CD casebook editions. Additional details and items can be found at the newly updated Oasis website. While fans initially took to Twitter and Facebook to voice their disappointment regarding no official band reunion, maybe these anniversary reissues, which capture the epitome of the band’s creative zenith, will be enough to keep devoted Oasis heads’ dashed hopes alive. Definitely. Maybe.